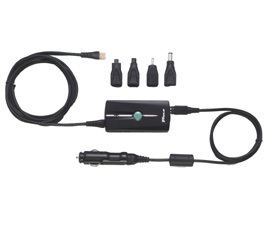 The Targus Universal Auto/Air Power Adapter is one of the most compact, portable power solutions for mobile users. Patented tip technology controls the voltage to match your notebook's requirements. It allows you to plug a compatible notebook computer into the airline seat with Empower capability or into a vehicle cigarette lighter. It provides a convenient way to power your notebook, computer, portable printer or mobile telephone. It is compact, lightweight, and has a total body and cord length of 4 feet with cigarette plug and airline adapter. This notebook power adapter is one of the safest ways to power and charge your notebook. Users with notebooks requiring voltage higher than 70 watts should note that this adapter will only allow your notebook to operate in Battery Optimized mode. Comes with tips 10, 20, 23, and 26 making it compatible with most Dell notebooks (tips 20 and 26 will provide power but will not charge some "C" series and all "D" series notebooks). Click Here to find the right tip for your device.